We were recently given the opportunity to check out some beauty products by Vapour Organic Beauty. They have won some awards through Allure Magazine, and we noticed them in the Birchbox shop last month. Have any of you tried them through Birchbox or through purchasing them on your own? We knew we had to check out this company when we realized they were organic AND winning beauty awards. Our eyes were drawn to the chic packaging- blue metal and plastic tubes house most of the products this company offers. You can check them out in more detail at www.vapourbeauty.com. 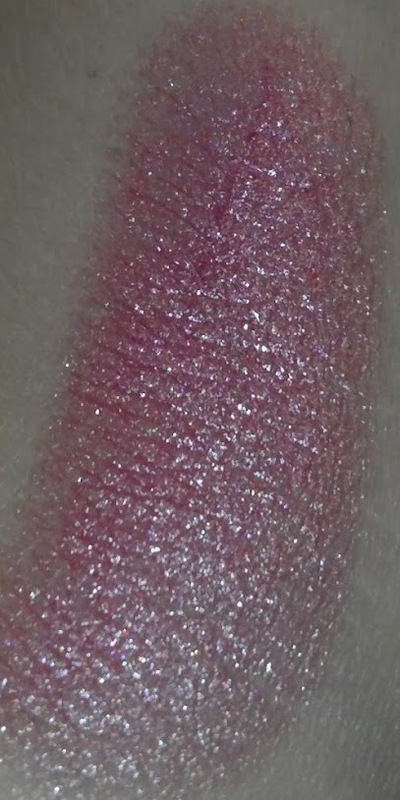 I was immediately drawn to this color on their website because of the uniqueness of the shade- it seems to be a lavender infused hot pink. As far as I can tell, these shades are not meant to be applied with a primer. The info on their website admits that since there are no chemical additives, it's not long wearing. It can be applied "sheer" to the lids or you can apply a mineral powder to add intensity- but note that they don't carry any. This is a gorgeous shade, and I loved the way it looked on the lids. When I applied it by itself, it lasted literally 3 minutes- I backed out of my driveway, took a look in my rearview mirror, and went "whoa, creases!" All that was left behind was giant sparkly chunks. 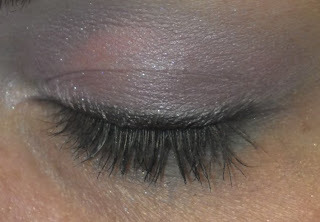 I didn't bring it with me to retouch, so I was stuck with sheer sparkly lids that became greasy and my eyeliner slid off with it as the day wore on. I tried to get a picture of it immediately after applying it on my lids, but it faded so quickly that the picture doesn't do it justice. 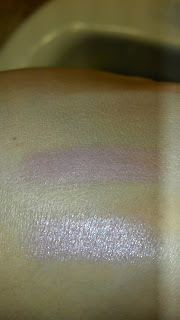 Wearing it with primer underneath decreases the intensity of the shade by a lot. 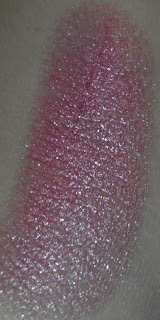 In this picture, the top swatch is Provoke applied over top of Urban Decay Primer Potion. 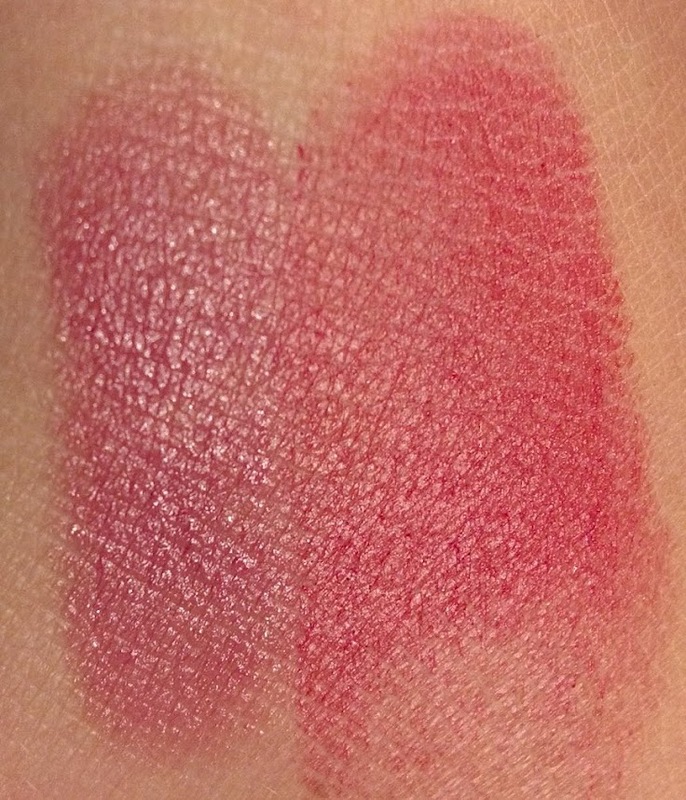 The bottom swatch is Provoke by itself. Huge difference! The primer takes away 90% of the intensity and beauty of the shade. This is a beautiful mauvey brown color great for year round and goes on creamier than most organic lipsticks I've tried. Over the span of a few hours it did fade in patches on my lips, and required a few touch ups, but did hydrate my lips while it was there. When it did finally fade away to nothing, I noticed I did have a bit of a ring around my lips from the residual product. If you are not opposed to re-applying during this day, this lipstick does feel great on the lips! I enjoy the creamy texture and the gorgeous color. This has the ability to be a star product in your makeup routine if you have the time to play with it a bit. I recommend the first couple applications of this product be right before you take your makeup off for the night so you get a chance to play but don't have to wear it in public. 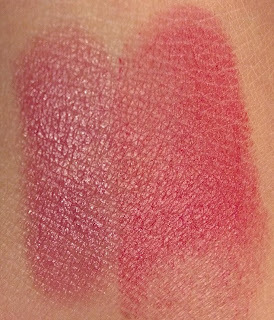 I enjoy this as a cheek stain, and even got it to work as a lip stain. The key to this product on the cheeks as to keep application to a bare minimum. A little goes an extremely long way, and if you apply to much it's easy to look very garrish. I had a hard time blending when I applied too much, so keep that in mind and you should have beautifully rosy cheeks that Snow White would envy! This is a product that won some Allure Beauty awards. I see why because the texture and color of these are awesome. I love applying just a little bit of this shimmer as a blush. Over time, it fades during the day leaving major glitter chunks. This can be pretty, and overall I really like glitter on my cheeks when I'm having a great skin day. I think this product looks great on a tan, and would look great on paler skin in the winter. It brightens up my complexion and gives me a nice glow when I wear it. I see why this is one of the more popular products in their collection! If you are into organic beauty, I would recommend checking out Vapour Organic Beauty! They have some really unique shades on their site that I haven't seen in other makeup lines, much less organic. If you have tried this line, tell us, what was your favorite product?